1. Preheat oven to 325 degrees and pre-line pans. 2. Heat stout and butter in a saucepan until butter is melted, taking care not to boil contents. Once melted, whisk in cocoa powder and vanilla. 4. In another bowl, combine flour, sugar, baking soda, cinnamon, and salt. 5. Add stout, butter, cocoa powder mixture to mixing bowl gradually. 4. Slowly add dry goods to wet and beat until smooth. 5. In greased or lined cupcake tins, fill 2/3 way. Bake for 10 minutes and let cool on a cooling rack. 1. Heat Fifty Shades of Grey Red Satin wine and sugar on high in a large saucepan or pot until it begins to boil. 2. Add in pectin, stirring thoroughly. 3. Bring back to a boil for at least one more minute. 4. Remove from heat, skim off any foam, and transfer to an airtight container. 1. Transfer Fifty Shades of Grey Red Satin wine jelly to a bowl. Stir until smooth. 2. Slowly stir in Red Satin one tablespoon at a time until jelly reaches a pourable consistency. 3. Transfer to a squeeze bottle. 1. Transfer ¼ cup scotch to an airtight container. 2. Break two arbol chiles in half and add to scotch, seeds and all. 3. Let sit for twenty minutes. 5. While scotch is infusing, melt 2 ounces of milk chocolate over low heat. 6. Beat softened butter and confectioners sugar on low speed with a standing or hand mixer. 7. Slowly stream in scotch. 8. Add melted chocolate and beat thoroughly. 9. Transfer to piping bag. 1. Let ½ cup of dried cherries sit in 1 cup of Red Satin for at least 24 hours. 2. Strain cherries and let dry for 20 minutes to an hour. 2. 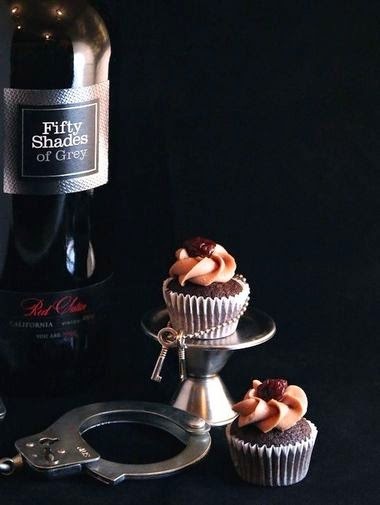 Fill the cupcakes with the Fifty Shades of Grey Red Satin wine jelly, using a squeeze bottle. 3. Frost the cupcakes to your liking, either with a piping bag or by hand.